For many years scientists have wondered what caused the fall of tektites around the world. But decades of debate have left crucial questions unanswered. Now it is time to consider the electrical possibilities. They are found on every continent and come in a variety of forms, but their distribution by type is not random. The regional association of different tektite types is evident in many of the names given to them. “Bediasites” from Texas received their name from the Bedias Indians. The location of Australites is self evident, as also javanites and philippinites. Moldavite, called the most beautiful tektite (often a translucent light green), comes from the Moldau River Valley in Bohemia and Monrovia. Some tektites appear as small glassy clumps. Others are more defined as buttons, teardrops, or quasi-spherical shapes, and dumbbells, rods, and disks are also known. In certain ways, tektites are like “concretions” we’ve discussed in recent Pictures of the Day. But often they are not constituted from the soil in which they are found. The evidence suggests they were dropped in place. No one can say with certainty how tektites are formed, and for this reason classification itself is often ambiguous. For example, most specialists do not agree whether “Libyan Desert glass”, though enigmatic, should be classified as a “tektite”. Charles Darwin popularized the idea that tektites are volcanic, but this idea was later discredited. Some scientists have also suggested that large comets may have sprayed the earth with these odd stones. As the space age arrived, attention shifted to the moon. In the 1960s, Dean Chapman and Howard Larson prepared a number of scientific papers on tektites, suggesting a lunar source. In 1963 the Journal of Geophysical Research published their paper "On the Lunar Origin of Tektites”. Chapman believed that, as large meteors struck the lunar surface, some of the material excavated by the impact escaped to space. He observed that some tektites, most notably those from Australia, show signs of “aerodynamic ablation”, a sculpting by passage through the Earth’s atmosphere at extremely high speeds, he believed. The picture above (top) shows three views of a specimen created experimentally by Chapman in Ames Research Center’s arc-jet facility, which is used to test various aerodynamic designs in intense winds generated by plasma discharge. The bottom set shows a well-preserved natural specimen exhibiting a surprising similarity to the experimental result. Indeed, as the U.S. space program began to confront issues of heating during reentry, this peculiar characteristic of some tektites inspired engineers to rethink the design of heat shields for spacecraft. Nevertheless, the notion that tektites traveled across space to arrive at Earth faces one seemingly insurmountable problem—the selective location of particular tektite types. Strewn fields of tektites, occurring within defined areas, are suggestive of regional, not global, events. The majority of specialists today believe that tektites, though originating on Earth, were blasted out of terrestrial soil by meteoric impact. They identify the chemical composition of various tektites with that of Earth’s crustal rocks. Reinforcing this interpretation was the discovery that some tektites harbored spherules of nickel-iron, the constituent material of many meteorites. Additionally, the many samples of lunar soil returned by the Apollo missions did not reveal the building blocks for tektites, whereas a primary base in terrestrial chemistry is increasingly evident. For example, the isotopic composition of argon inclusions in sealed bubbles suggests a terrestrial origin, according to many specialists. Prof. S.R. Taylor, in his book "Solar System Evolution", writes: "The source of tektites has been demonstrated beyond reasonable doubt as being due to melted terrestrial (usually sedimentary) rock splashed during meteorite impact. The whole argument over a lunar vs. terrestrial origin of tektites was an interesting example of the inability of the protagonists for a lunar origin to recognize the decisive geochemical evidence in favor of a terrestrial origin." Yet here too the filters of prior beliefs give rise to another “inability … to recognize … evidence.” Inherent in Taylor’s reasoning is the assumption that a “terrestrial origin” can only mean “caused by meteoric impact”. But field and laboratory evidence, as well as theoretical considerations, contradict this assumption. As noted years ago by astrophysicist Thomas Gold, impacts cause little melting. Much of the impact energy is dissipated in “shock displacement”, and what heat is generated is largely radiated away before conduction can transmit it into the debris. In the Electric Universe model, this observation is crucial. An electric arc will not only rip up the rock it strikes but also envelop the debris in a “plasma oven” effect that evenly melts the exposed surfaces. Small pieces of debris may be completely melted. At the same time the arc will accelerate the debris, scattering it over a wide area. An interplanetary arc with the power of a “thunderbolt of the gods” could even hurl some of the debris into space. Furthermore, electric discharge is the one process known to produce small spherules. Thus the NASA experiment in an arc-jet facility shows how an arc discharge can replicate tektite formation perfectly. To these considerations Wallace Thornhill adds another. He contends that a large incoming body will be disrupted electrically before striking the ground (as in the notorious Tunguska explosion). The sudden internal electrical stresses following a catastrophic lightning bolt between the Earth and the bolide will shatter it. So when geologists identify a particular crater as the apparent source of a tektite field, the electrical interpretation does not look to an “impact” to excavate soil and rock but to the effects of an explosive electrical discharge. In this view, the well-documented surface etching and pitting of tektites is a predictable consequence of their electrical creation, whereas geologists posit unknown chemical processes after burial in the soil. Debris electrically accelerated into the sky and falling back over a broad region might account for native traditions from Europe to China and Australia. These traditions say that tektites fell from the sky or were cast down by native gods of the thunderbolt. Such traditions remind us of the mythic “thunderstones” hurled by lightning-bearing gods in tribal accounts the world over. 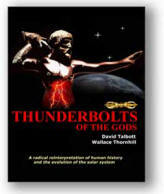 (See Thunderbolts of the God, page 86). It is not unreasonable to wonder if such traditions influenced the first scientific theories of tektite origins, which linked tektites to lightning strikes. The relationship of tektite formation to the Tunguska event is also worth exploring. Though no crater was produced by the event, Russian scientist Andrei Yu. 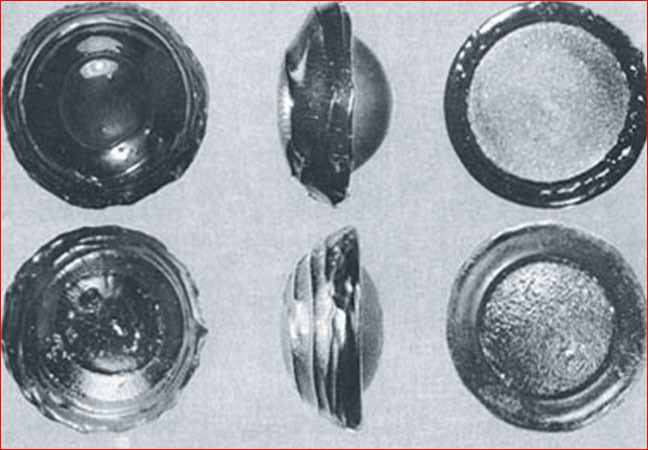 Ol'khovatov notes that “some tektite-like objects were found at the epicenter of the 1908 Tunguska explosion. A Russian researcher G. Sal'nikova writes that below fallen trees and in rock cracks black glassy layered particles were discovered among others. Their dimensions were about 1 cm.” The primary constituent was silica.